With Mt. Hood at its back door, the Columbia River at the front and an eclectic collection of shops in its historic downtown core, it also isn’t hard to see why those who know about the place can’t stay away. 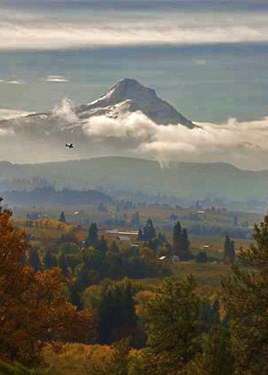 Hood River, which boasts nearly 7,000 residents, takes its name from the river Hood (stated thusly to not confuse the two). However, both the town and the river came close to being called Adams River and the river Adams. Between 1830 and 1834, Hall J. Kelley led a campaign to rename the Cascade Range as the President’s Range and rename each major Cascade Mountain after a former president. He planned to start by naming Mt. Hood (named in 1792 in honor of Lord Hood of British Admiralty), after President John Adams. However, the mapmaker made a mistake and placed the name on the mountain to the north thus preserving the name of Mt. Hood. The community that bills itself as always in season is not only one of the most agriculture-rich regions on earth, but the world’s wind surfing capital as well. Many people who came for the water sport, stayed on (or came back) to help the town continue to be the unique place it is today. 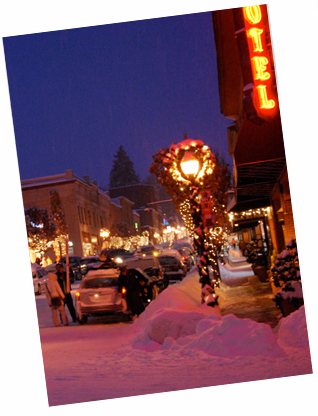 “Though some things slow down during the winter months, the downtown scene isn’t one of them,” said Jamel Badrieh, marketing director for the Hood River County Chamber of Commerce. “We officially kick off the holiday season the first Friday in December by holding a fun and funky parade through downtown and lighting our traditional Christmas tree. The stores compete in a window display lighting contest, the Mt Hood Railroad hosts a magical Journey up the Hood River Valley aboard the Polar Express and Santa makes regular visits. “Also, Mt. Hood Meadows ski resort is a mere 40 miles south and there are ample cross-country skiing trails just minutes outside the town’s city limits. Hood River boasts wonderful shopping, great restaurants, art galleries, coffee shops, nightlife and theaters that have a friendly, small town feel. 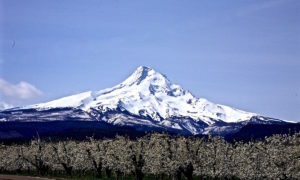 Hood River’s Fruit Loop, approximately 35 miles of orchards, fruit stands, wineries, forests, farmlands and friendly communities, probably is one of the community’s major draws and arguably the biggest agri-tourism attraction in the state. Visitors can spend as little as a morning or several days exploring the Fruit Loop’s unique offerings. It is a mecca for purchasing vine ripened fruit and vegetables and value added products like jellies and jams, all while having a good time at many of the u-pick fruit farms. The annual Blossom Festival begins the season the third weekend in April and it is a steady stream of pancake breakfasts, BBQs, local arts and crafts shows, and antique sales. The festivities don’t stop until the last bit of fruit is harvested in the fall. It is a place that stages Cherry Jubilees, Lavender Farm Daze, Pumpkin Patches and Apple Cider Squeezes. 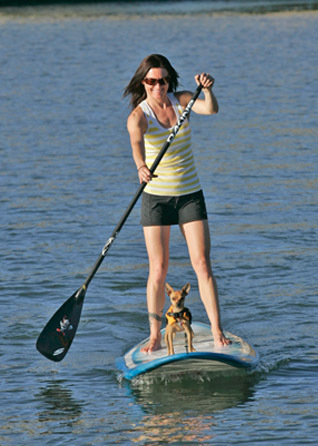 By the time winter is over and the weather warms up, families and summer sports enthusiasts are back windsurfing, kite boarding, kayaking and paddle boarding in the Columbia.